Have you really figured out the root cause of any issues found in your medical device company? Root cause analysis is an important part of quality management and dealing with any quality issues that come up for your company. Unfortunately, a lot of companies don’t do this part very well. 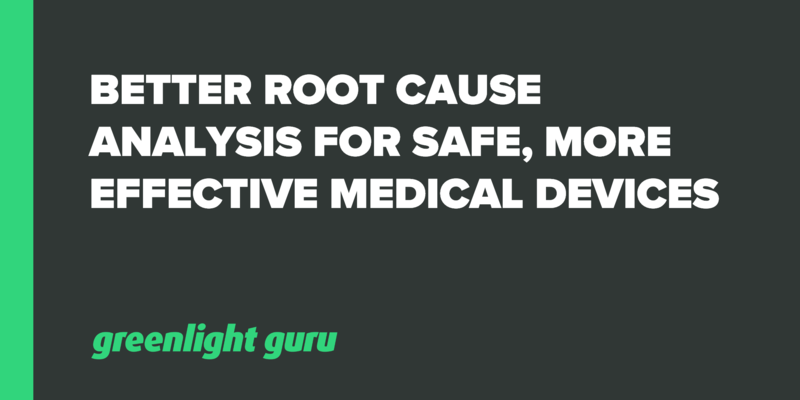 The underlying aim of root cause analysis, along with any other part of your quality system, is to produce safer, more effective medical devices. For this reason, root cause analysis should be seen as an important opportunity to make improvements rather than a “requirement” you need to check off. Free Bonus Giveaway: Do you tend to default to "user error" as a root cause? There's more to it. Get our 4 tips here. Root cause analysis is as it sounds; getting to the root cause, triggering event or circumstance for an issue identified in your company. We’ve talked a lot about incidents that may lead to CAPA; complaints, audits and non-conformances are all quality data sources to capture an issue. These lead to the creation of the problem statement. In all cases, an investigation should be carried out to deal with the issue. Root cause is an important part of that investigation because identifying the root cause of an issue allows you to rectify it at the source and prevent it from happening again. For example, let’s say a customer has complained that a device that they purchased broke. To really determine what happened, why it happened and how you can prevent it from happening again in the future, root cause analysis is necessary. How big is the problem? Is it one product line or multiple? Are the products out in the field or not? You need to contain the issue right away, but the end goal is to correct the situation and prevent it from recurring. Once an investigation of the issue has been conducted, you have all the facts or evidence needed to evaluate and determine the root cause. We don’t really like to talk of root cause analysis in the sense of “creating a procedure” because that might hint that you can create one standard process or procedure for use with any incident. The fact is, there is no “one size fits all” solution for taking care of root cause analysis. Pro Tip: Don’t try to find “one tool to rule them all” to take care of every situation where you need to do a root cause analysis. Instead, evaluate a few different options and choose what you think will work best for the situation. 5 Whys - this is one we tend to prefer as it relatively easy to get team involvement in the process. This is because they don’t really need to have special knowledge of the procedure; you’re simply asking “why” questions until you get to the root. Fishbone diagram or Ishikawa - Slightly more complicated, users will have to know the procedure. Fault tree - Again, other users will need to know the procedure. FMEA - This is very thorough for working through different root possibilities; but again, it’s more complicated and users will need knowledge of the process. While most of these tools can be applied fairly universally, again, you should choose the method which will be best suited to the situation. One tip we always go with is that your best bet is to use a cross-functional team to go through your root cause analysis. Engineering - Probably the most obvious. If we get back to our example of the customer who complained that the device broke, engineering is interested from a product manufacture, design, quality and materials point of view. Sales - What if the product broke because the customer misused it? Your analysis would then go into why they misused it. Could it be because clearer training is required in the first place? This is a good reason to have sales involved. Marketing - So if the customer did misuse the product, was intended use clear in the first place? Marketing needs to be involved to ensure they’re highlighting the product features and making intended use clear. Quality - What if the product broke because there was a weak bond between components? Quality needs to be on the case, too. Regulatory - This won’t be required every time, but a regulatory body might be involved if something needs to be changed about the labeling, design or instructions for use. You may be re-filing paperwork with FDA, for example. When an issue such as a non-conformance, complaint, audit issue or CAPA comes up for medical device companies, one of the first things to do is to state the problem in clear terms so that an investigation can be carried out. Usually, this involves the formation of a problem statement. The big mistake that many companies make with root cause analysis is they don't complete root cause at all, but restate the problem statement or issue as the root cause, often just slightly reworded. This is often as a result of not really using a clear methodology to get to the root cause, or not really understanding the whole point. Pro Tip: Look at your root cause and make sure it’s not just a reformation of the problem description. You haven’t identified the real root cause in that case so the exercise has not been of value to you. What should happen after root cause analysis? The goal of root cause analysis should not only be to get to the bottom of why the issue occurred, but to identify opportunities for improvement. This could be anywhere within the whole lifecycle of your product, including manufacturing procedures, design, quality checks, labeling and marketing. Often people tend to treat the symptoms rather than the actual root of the issue. The tendency is to want to just correct the immediate issue and get on with things, which means the chances are high that it will happen again. If this happens, then you’re missing the point; the ultimate goal of root cause analysis is to produce safer, more effective products. Medical devices will get put to extremes quite often and companies need to be aware that as you scale up to thousands of units being manufactured, this is often where issues creep in. In fact, you can almost count on it. We often see overuse of “user error” as the quoted end cause. If your company is leaning on that as an issue, you have to look at why the user's issue actually happened. It usually runs deeper than “user error” and there is probably something you can improve on. Is the device intuitively obvious to use out of the box? Is the labeling or user manual clear enough? Remember that users rarely read the manual or instructions. It’s not necessarily the answer to add more labeling. Did you design the product so that it gets put under strain during common use? Could the manufacturing process have resulted in a weak bond between components or wrong adhesive used? There is always more you can be discovering and more you can be doing for the opportunity to improve. Remember, if you’re getting issues with patient use, this is the ultimate thing you don’t want for your device. The patient might get hurt or the product doesn’t perform for them and they need to wait for another procedure. You ideally want to prevent this scenario from happening by having a robust quality system and using those quality data sources as leading indicators before issues become problematic. It might seem like a pipe dream for some, but discovering something before it becomes an issue is the best case scenario for any medical device company. It's important that everything is under control prior to devices leaving your facility for the market. You can’t always do this, but being proactive about following up any issues and doing regular quality checks can help you to prevent something from becoming a problem to begin with. Don’t just wait until an issue happens. For those issues that do occur, make sure you are identifying real root cause rather than restating a problem, using proper methodology to root it out and making use of a cross-functional team to do so. Safer products should always be the goal. 4 Reasons the Root Cause Isn't "User Error"